Meet 50-year Eichler owner Maryhill Gleason, at age 100 the embodiment of Eichler-owner independence. Gleason's kitchen, with uniform flooring and free of clutter, allows her to move freely on her wheelchair. Gleason easily maneuvers over her low makeshift ramp. 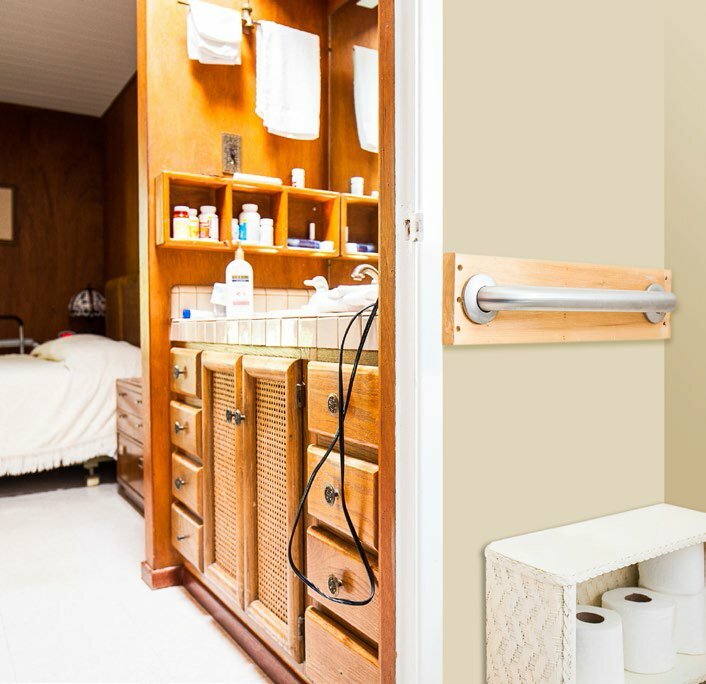 This heavy-duty grab bar in the bathroom was one of the few senior-friendly modifications that was needed for Gleason's Eichler. Maryhill Gleason turned 100 last Fourth of July—but that hasn't stopped her from continuing to enjoy her Sunnyvale Eichler, which she's called home for the past 50 years. Energetic, with a twinkle in her eye, she finds peace these days sitting in her Eichler living room looking out on a lovely garden. Gleason is the embodiment of Eichler-owner independence as she reminisces about her global travels during and after World War II, and her years as the first woman to help build missiles at Lockheed Martin, where she worked on the Polaris, Trident, and Poseidon submarine programs. Gleason is like so many other Americans today who are living longer, healthier lives. 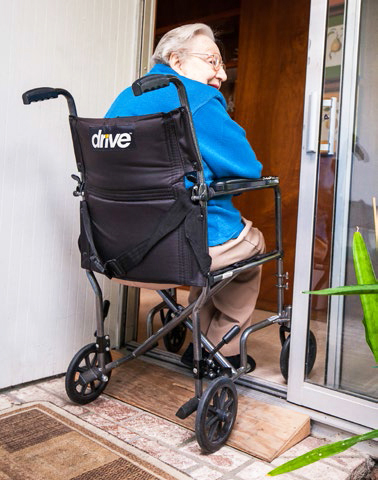 As they do, more and more are opting to 'age in place'—choosing to stay in their current residence during their golden years, rather than moving to senior or assisted living. Home-improvement and real estate professionals, and of course Eichler homeowners themselves, tend to agree—Eichler homes are an especially good match for life in the retirement years. 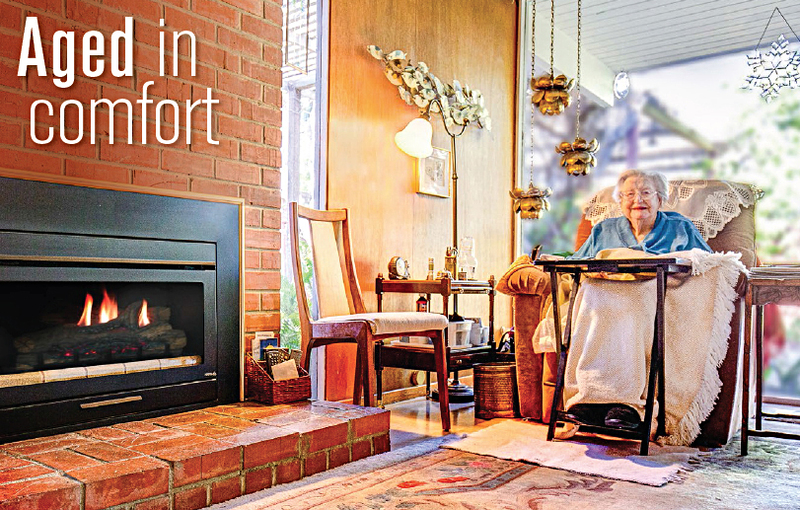 "In fact," says Ron Key, owner of Keycon, Inc., who has been remodeling Bay Area Eichlers for 40 years, "the very design elements that are inherent in Eichlers are the things that now are architecturally being designed in [new homes in general] for accessible living." But exactly what makes Eichlers so compatible with aging in place, what have your neighbors done to facilitate this process, and what practical things can seniors do to provide their own homes and themselves added comfort and accessibility? Think about it: Eichlers are single story (no stairs!) with on- or near-grade, level entries. They characteristically feature open floor plans suitable for smooth flooring materials. And there's lots of glass to let in natural light. Add to this their modest square footage by American standards—no downsizing necessary—and it becomes clear why so many of our senior Eichler-ites believe that they'd be hard-pressed to find a satisfactory alternative. According to Maryhill Gleason's daughter, Laura Lorman, "I saw her go from being a vibrant, being-able-to-walk person to, 'Okay, I need the walker or the cane, then the wheelchair.' But she was able to age in place because the house is all one story, there are no steps." There's a small step-up at the entry leading into the house from the atrium, but here, a friend built a small wooden ramp. "She's also had to put a couple of heavy-duty grab bars in the bathroom," says Lorman, "but other than that, we haven't had to do anything else. So it's been a very easy house for her to age in place." The friendliness of Gleason's Sunnyvale neighborhood has also added to her enjoyment of her Eichler as she's aged. She knows virtually all of her neighbors—"they've been here a long time," Gleason says, "and everybody kind of looks out for one another." When Fred and Jean Leonard bought their Eichler in the San Mateo Highlands in 1969, they were at once attracted to the neighborhood and the home. 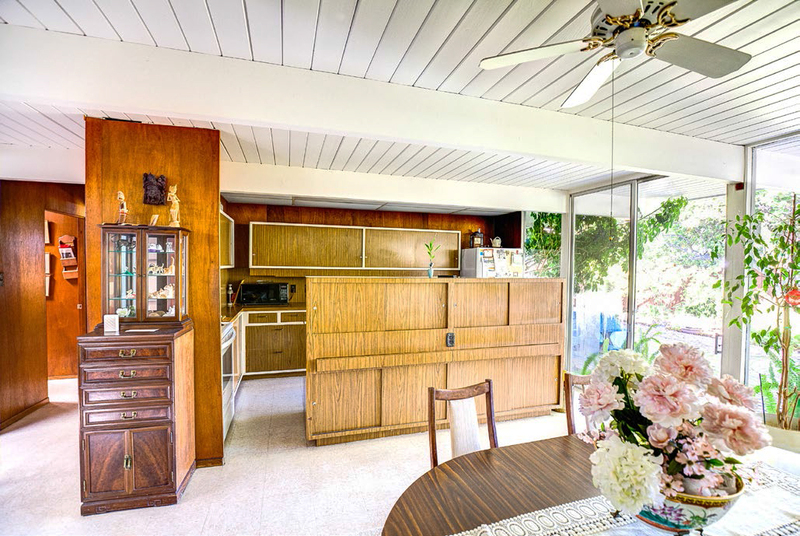 The physical location of the neighborhood, set high on a hill overlooking a valley and somewhat isolated, and the architectural harmony of the 700-plus-home Eichler tract helped reinforce the sense of community.